By 1989, I was even more influenced by what was going on in the UK and US, and while many international singles still performed well in Australia, there were a stack of R&B and dance songs that either never saw the light of day here or, if they were released, failed to achieve any chart success. I'll follow the same format for my favourite songs from 1989 as I did for 1987 and 1988, and count down my top 100 - but, I'll only talk about each artist once and not cover songs I've dealt with elsewhere on this blog. House music and diva vocalists go hand in hand, and as the dance genre went mainstream in the late '80s, there was no bigger diva than, er, Adeva. Born Patricia Daniels, the American singer with the fierce haircut had a string of massive club hits and not quite massive chart hits, including this song with the New York producer, which was my favourite over better known tracks like "Warning!" and "I Thank You". Adeva continued releasing records throughout the '90s which were big on the dancefloor, but not so big on the charts. Boasting possibly the worst title for a song ever, the one-time hit-maker floundered with this new track from his greatest hits collection. Whether it was the dodgy title (Bond film Licence To Kill came out in 1989, but that's no excuse) or the fact that music tastes had moved on, Billy didn't even crack the Australian top 50 with this song despite it being fairly similar in style to hits like "Get Outta My Dreams, Get Into My Car". In fact, that chart-topper would be his last chart appearance in Australia. Regular readers of this blog will know I was not a fan of U2 in the late '80s - which makes the appearance of this double A-side single on this list a little unusual. But, it was all down to the cover of "Everlasting Love" which accompanied Rattle And Hum track "All I Want Is You" - a song I found a little dull. U2's energetic version of the much-covered "Everlasting Love" was huge on radio at the time and I suspect the single's chart success in Australia (it reached number 2) owed a fair bit to its inclusion on certain formats. Their collaboration with Dusty Springfield had been such a success that, in 1989, Pet Shop Boys turned their attentions to another faded star and propelled her back up the charts (at least in the UK). The first studio recording by Liza (with a Z) in 12 years, "Losing My Mind" was, naturally, a Broadway number that had been given PSB's trademark high-energy treatment. The song, written by Stephen Sondheim, came from 1971 musical Follies and cracked the UK top 10. Liza released a full album, Results, produced by PSB and covered a number of the duo's songs, including 1987 single "Rent", as well as trying her hand at Tanita Tikaram's "Twist In My Sobriety" and another song we'll see in Part 4 of this list. The former Shalamar singer had enjoyed considerable US success with her debut album, and that continued with album number two, Larger Than Life, which contained this US number 2 hit. Interest in Australia had died down since her 1987 debut with "Looking For A New Love" and, as a result, "Real Love" didn't make the top 50 here - but it was the type of funky R&B song with which the US chart was filled in 1989. What I didn't know until now is that the video for "Real Love" was directed by David Fincher - I must go and watch it again now! Compared to other stages of his career, the late '80s weren't the most successful of periods for Elton John. In Australia, he hadn't had a top 10 hit since 1986 ("Heartache All Over The World") but hopes were high for his 1989 album, Sleeping With The Past, from which this single was lifted. It did OK, reaching number 14, but the second single, "Sacrifice" would do even better - finally returning him to the top 10. Those two tracks are notable also for the fact that, although they individually flopped when initially released in the UK, together they gave Elton his first solo UK number 1 hit when re-released as a double-A side single in 1990. He'd only previously reached the top spot with the duet "Don't Go Breaking My Heart" in 1976. This song showed up in my 1981 countdown (when it was a minor hit in the US) - and here it is again, in remixed form, eight years later (when it was a reasonable hit in the UK). Revamped by remixer of the day Justin Strauss, the re-release was in support of a greatest hits album and promptly shot into the UK top 20. The new mix sharpened up the beat but thankfully didn't sap the song of its inherent soulfulness - and it remains one of the best R&B songs of the decade. As we had done with Jody Watley, Australia had moved on from UK group Swing Out Sister by 1989 despite the fact that they released another retro-sounding pop gem in "You On My Mind", which was the lead single from the Kaleidoscope World album. The UK, it would appear, had also moved on from the group, who'd scored a number 1 with their first album, and this song barely scraped into the top 30 there. There was some good news, however, since Swing Out Sister were now "big in Japan". At least someone still cared! Body And Soul had been a pretty successful debut album for the Kiwi-born, Australian-based singer, and her second album, Shiver, performed even better on the albums chart, despite the fact that Jenny did her best to kill the project by releasing "Saved Me" as the first single from it. Thankfully, the supremely catchy "She Has To Be Loved" righted that wrong - and both this single and the album sailed straight into the Australian top 5. This wouldn't be her last - or biggest - Australian single (1991's "Break In The Weather" got to number 2), but it would be the last single of Jenny's that I really liked. Another singer who was onto album number two... This time round Taylor toned down the hair and make-up, and moved towards a more pop/rock sound instead of the dance style f the songs which had made her a star. This lead single from the Can't Fight Fate album didn't make the top 50 in Australia, but it did reach number 5 in the US. Bigger hits were to come from the album, however, with 1990 proving to be a particularly successful year for Taylor down under. UK R&B group The Chimes released a couple of underrated singles towards the end of 1989 - this track and "Heaven" - but it wouldn't be until their 1990 cover of U2's "I Still Haven't Found What I'm Looking For" that the trio would break through. They only released the one self-titled album before singer Pauline Henry went solo, but it's still an album I listen to today. Probably the last artist anyone expected to stage a comeback in 1989 was the singer born Vincent Damon Furnier. Although he'd consistently released new music throughout the '80s, Alice hadn't scored a major hit since 1978's "How You Gonna See Me Now" hit number 9 - but the success of "Poison" came down to two things: 1) the fact that it's an awesome song and 2) the fact that the video features a heap of scantily clad models (an R-rated version containing naked breasts was on high rotation on late-night music shows). 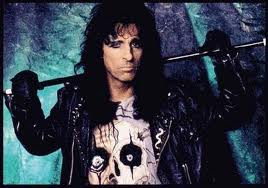 Alice achieved another hit from the Trash album with "Bed Of Nails", but "Poison" was the beginning and end of my interest in him. A song so obscure it doesn't appear on YouTube in any way, shape or form - and I still only have it on the 7" single I bought at the time. Robyne is an Australian singer/songwriter who was signed to Mushroom Records at the time, but is probably best known for being one of the many artists to perform "Stairway To Heaven" on ABC comedy series The Money Or The Gun. I live in hope I'll one day track this quirky pop song down on CD or MP3. EDIT: It's now on YouTube - thanks to me (and regular reader ohnoitisnathan)! My first video upload, which hopefully won't get yanked. In Part 2, an incredibly diverse bunch of genres - from Euro dance to Scandopop, from Aussie rock to a MOR ballad, and a song that will be played at wedding receptions from now until the end of time.